First, Balaam said to Balak to construct seven altars and have seven bulls, and seven rams ready to sacrifice on those seven altars (Numbers 23.1). 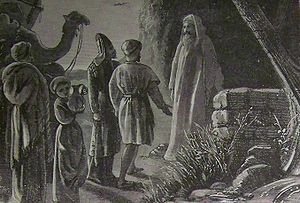 Then Balaam and Balak offered a bull and a ram on each altar, and Balaam the prophet told Balak the king of Moab to stay by his burnt offerings, while Balaam went to meet with God on a desolate height. “And God met Balaam, and he said to Him, ‘I have prepared the seven altars, and I have offered on each altar a bull and a ram'” (Numbers 23.4). Balaam believed he had offered the perfect number of sacrifices to appease God, and as the rest of the narrative shows, Balaam hoped this would change God’s opinion and He would curse Israel, thereby bringing the reward from King Balak. Again, we say, as in a previous posting, that seven is certainly an important number to God, but it is not a superstitious number, nor is it a magical password, nor is it something that supersedes being right with God, which Balaam no longer was for seeking the wealth that Balak offered for cursing Israel. This entry was posted in Numbers, Seven and tagged Altar, Balaam, Balak, Bible, book of numbers, God, Israel, Moab, politics, religion, seven in the Bible, sevens in the Bible. Bookmark the permalink.